Seder plate? Check. Matzah? Check. Actual text you need to read at the seder? Oh yeah. If you’re looking for a great haggadah to guide your family through the Passover seder, here are our favorite picks. 1. 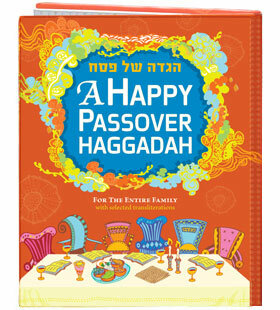 A Happy Passover Haggadah ($29.94) This is definitely one of the most aesthetically pleasing haggadot we’ve seen, and it’s perfect for the whole family. With both Hebrew and English illustrated with bright bold colors, this hardcover book is a great addition to the seder. 2. The Bronfman Haggadah ($16.10) This brand new haggadah from from philanthropist, Jewish leader, and Kveller supporter Edgar Bronfman is another beautiful, hardcover haggadah illustrated with gorgeous watercolor paintings. 3. Sammy Spider’s First Haggadah ($4.88) Part of the well-loved Sammy Spider series, this haggadah is great for kids 5 and up and if full of fun Passover songs set to popular songs. 4. Richard Codor’s Joyous Haggadah ($8.95) This cartoon haggadah is pretty brilliant. Illustrated with fun, whimsical drawings, this one retells the Passover story with plenty of humor. 5. 30 Minute Seder ($5.95) How can you not love a haggadah with a time limit? If you’re worried about keeping all the kids in their seats long enough to get to the food part, this brief but thorough text is meant for the whole family to follow along. 6. Our Haggadah: Uniting Traditions for Interfaith Families ($13.59) Written by interfaith couple (and NYT Bestselling authors) Cokie and Steven Roberts, this haggadah adds a unique perspective for interfaith families celebrating Passover. 7. My Very Own Haggadah ($2.56) For kids 4 and up, give them some seder ownership with their very own haggadah, full of explanations of the holiday symbols, songs, crafts, and picture to color. 8. Haggadot.com. If you’re having commitment issues, you can mix and match your favorite readings, artwork, and even video clips to create your own haggadah on this super helpful website. Head over there now and you’ll find some of their latest clips include “Harry Potter & The Escape from Egypt,” which is amazing. *By purchasing any of the above items from Amazon, a portion of the proceeds will help support Kveller, which would make us one very happy not-for-profit website. See all of our Passover shopping guides here.